Virtual Camera is only necessary if you want the guests to see the show output. Otherwise, you can just use the host's camera back into Skype. To bring the Skype callers in as guests you can either Screen Capture or set up Skype to send NDI output. Then after making the call bring in the guest and host as separate shots. Regarding Rendezvous, a lot does depend on your guest. They have to have the bandwidth and their browser must be compatible. Browser updates can break compatibility... or fix compatibility. That's a bit of a moving target, unfortunately. We certainly have many users who prefer Rendezvous to Skype and find it much easier to use. Simply have your guest check FireFox and Chrome. Usually, it'll work with one or the other. On Windows, Microsoft has certain programs that can't be screen captured. Skype from the Microsoft store (and their Edge browser) may block capture. On the other hand Skype from Skype's site (sometimes called Classic) can be captured (but Microsoft may end "Classic" at some point). Just a FYI. For OSX, they've removed NDI support unfortunately. 8.39.0.175 still works. The later one does not. The GUI setting to turn it on is completely removed. Regarding Rendezvous - I still use it every week. But I agree, there are some issues that impact some remote devices. What is interesting to note is that it works with appear.in reliably, where wirecast fails... so not a browser problem. Anyway. I will continue to work with support to try to identify the cause. For OSX, they've removed NDI support unfortunately. 8.39.0.175 still works. That's the latest version when I check. Are you watching the beta development of the next update? It was literally a few days ago when I checked. Main system had new Skype and no NDI. Other system had older Skype and had NDI. Now, both of them are on the same version (assume they both updated), and NDI is back on both. So happy outcome! (At least as far as Skype is concerned). Greg Kuhnert Good to hear. That's a relief. I don't understand how people are doing this live?? I'm just trying to record in Wirecast to show during the live show because it is always a nightmare trying to get callers in. My goal is to have the Skype caller see and hear the main feed...I can't get the screen capture to work...tried the screen reigon( which seems like a back door band-aid) and I wasn't able to get that to work. Is my only hope to pay the extra $200 for something that might not work for me and just roll the dice...We have between 8 and 15k viewers every week and bringing in live calls is vital to the evolution of the show. tim sutton NDI input is in Wirecast Studio. 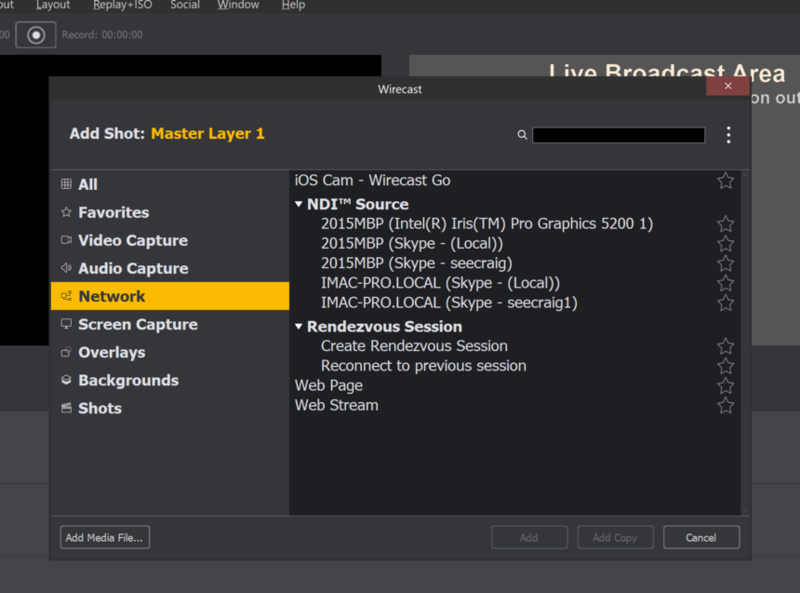 NDI output is Pro but you don't need that for Skype input into Wirecast. It works fine in Wirecast Studio. For going into Skype, Wirecast Virtual Camera would be viable. That's assuming Skype doesn't break compatibility and it may in some versions. Again if your version of Skype is Microsoft it won't work but that's due to Microsoft unfortunately. You can't capture Edge for the same reason. Use Skype Classic. All this is why we're working on Rendezvous and its use of WebRTC. There's still more work to go through. tim sutton Alas this is all Microsoft's doing. If NDI can't capture it then their certainly preventing capture. tim sutton Using Skype 8.39 NDI on Windows 10 I had no problem getting input into Wirecast 11.1.2 Also brought in NDI Scan Converter on the same machine capturing the desktop and NDI from Skype on another computer. In short, no problem capturing Skype with its built-in NDI out or NDI Scan Converter. It's definitely working as expected. CraigS so is that the answer..."not our fault" so there is no way for me to get video calling on my show...? tim sutton It's not an issue with Skype, NDI, Wirecast. It certainly may be something else but it's not clear what that is with the information provided. I can only make "blind" suggestions. If you can't get NDI to work in either Skype or Scan Converter there's some issue with your setup. Disable any firewalls on your system. Reboot the computer. Try NDI Scan Converter again. It should at least be able to capture your desktop. Keep in mind I tested three different products. Ours, Microsoft Skype, Newtek NDI Scan Converter. All working together as expected so the fault isn't ours, Microsoft's, Newtek's. So there's something else. CraigS if you could do me a solid and give me a few step by steps so it's all in one place...that would help..I could see if I am missing a step...but I tried everything you've said and still get the black screen...is there a program that can block Microsoft from blocking the recording of the desktop and windows? tim sutton You may not be able to screen capture specific Microsoft programs like Skype or Edge but NDI should work. That's why I think there's another factor. What comes to mind is something security. I see problems with screen capture but none with NDI on my system. You should have a Windows Control Panel for your Firewall. I have mine on though (Windows Defender Firewall) and it there's no impact on NDI. NDI is pretty resilient so I'm trying to think what would block it especially if it's running on the same computer as Wirecast. I'm not sure if there's a custom security setting that would block it. I assume you're running from an Administrator account. Enable the Private Network Location in Windows 10 but that's shouldn't be an issue for seeing its own computer. Firewall, Antivirus or Security software might be blocking NDI access. You'd have to check your particular program's docs to make sure it's not blocked. A different Subnet could be an issue but that shouldn't impact running on the same computer. Being on multiple networks (wifi and ethernet) at the same time can be a problem but, again, that shouldn't impact running on the same computer. You may want to run Newtek NDI Video Monitor and not use Wirecast and see if Skype or Scan Converter show up in that. That will take Wirecast completely out of the picture and just test NDI. This both Skype on the local machine Windows 10 with Wirecast and Skype on the other machine on my network which is a Mac. Skype has NDI enabled there so it all shows up as sources in Wirecast on Windows 10 . I get video on shots created with any of the sources listed (I checked them all). 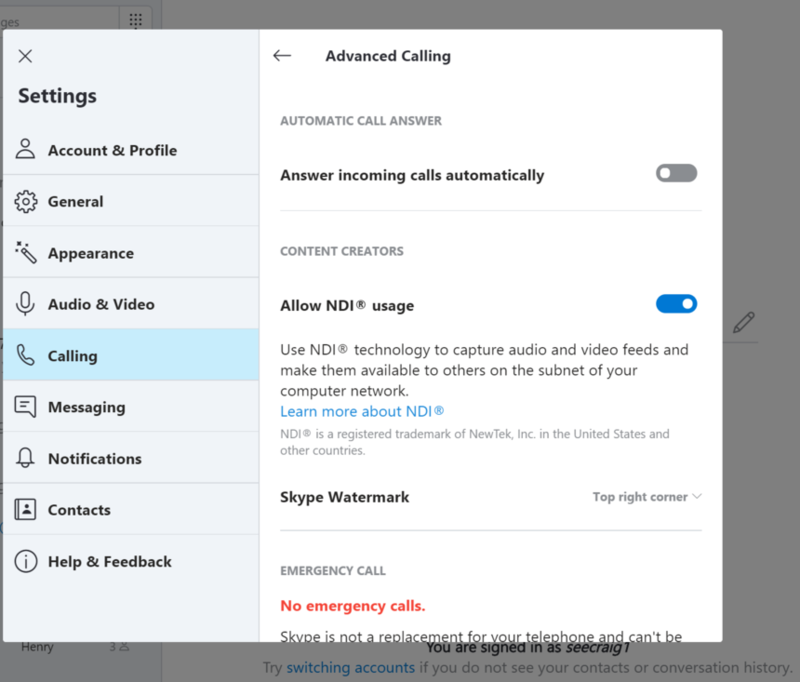 Skype > Settings > Advanced > Allow NDI usage. Then I make the call. Then I open Wirecast and wait a short bit and go to add the shot as shown above and it's there.